Hilo attorneys (from left) Paul Hamano, Al Konishi, Peter Kubota, Michelle Oishi, Jill Raznov, Jennifer Wharton, and Jackie Mena (pictured with Hawaii Supreme Court Chief Justice Mark E. Recktenwald (center) and Third Circuit Chief Judge Greg K. Nakamura (second from right)) received special recognition from the Hawaii State Legislature for volunteering more than 10 times each at the Hilo Self-Help Center in 2018. These “super volunteers,” together with Melody Parker and Austin Hsu (not pictured), handled over 130 sessions providing legal assistance to the public. HILO, HI – Forty-one attorneys were recognized during the Hilo Self-Help Center Recognition Awards on January 28 for providing more than 1,000 free legal consultations to people who sought assistance in 2018. The recognition ceremony was part of the Hawaii County Bar Association’s annual meeting. The Hilo Self-Help Center was established in July 2012 as part of the Hawaii State Judiciary’s commitment to increasing access to justice in the courts. Since opening, more than 6,000 people have been assisted by volunteer attorneys providing legal information on civil matters, such as temporary restraining orders and divorce. To date, this center has served more people than any other courthouse self-help center in the state. These services have been provided at almost no cost to taxpayers. 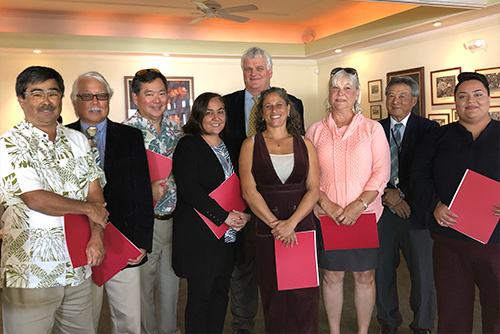 Volunteers were recognized for their service by Chief Justice Recktenwald, Third Circuit Chief Judge Greg Nakamura, Chief Court Administrator Lester Oshiro, and Deputy Chief Court Administrators Cheryl Salmo and Dawn West. The attorneys who were honored are: Francis Alcain, Lincoln Ashida, Christopher Bridges, Jeremy Butterfield, Kenneth Goodenow, Jo Ann Goya, Belinda Hall, Doug Halsted, Paul Hamano, Ray Hasegawa, Gerry Hasegawa, Charles Heaukulani, Bill Heflin, Mike Kagami, Nelson Kinoshita, Al Konishi, Peter Kubota, Kris Laguire, Demitri Lametti, Dwayne Lerma, Shaunda Liu, Craig Masuda, A. Jaqueline N. Mena, Jennifer Ng, Jeffrey Ng, Michelle Oishi, Melody Parker, Danny Patel, Jill Raznov, Hawaii County Prosecuting Attorney Mitch Roth, Christopher Rothfus, State Rep. Joy San Buenaventura, Christopher Schluter, Amy Self, Andrew Son, Steven Strauss, Al Thompson, Ivan Van Leer, Molly Ward, Jennifer Wharton, and Jennifer Zelko-Schluter. Also acknowledged was AmeriCorps Advocate Christy Peace, who, through the Legal Aid Society of Hawaii, organizes the Self-Help Center at the Hilo Courthouse. In addition, the chief justice recognized Peace, Bill Heflin, the Hawaii County Bar Association, and the Senior Counsel Division for organizing three special Disaster Relief Clinics in 2018, where 23 attorneys volunteered to provide free legal assistance to over 170 people who were impacted by the volcanic eruptions. Visit the Hawaii State Judiciary website for more information on the Self-Help Centers.